The conversion of aboriginal people in Australia to Islam is a growing phenomenon, but the reasons for and the extent of this new interest in the religion are complex and in dispute, according to a new study. Australian census figures show that from 2001 to 2006 there has been a 61 percent increase in Aboriginal Muslims, growing from 622 to 1,010. A future Muslim? (© 2009 Guido Amrein | Dreamstime.com). In a paper presented at the meeting of the Society for the Scientific Study of Religion in Baltimore in late October attended by Religioscope, researchers Helena Onnudottir, Adam Possamai (University of Western Sydney) and Bryan S. Turner (Wellesley College) note that the media and some Muslims have reported the phenomenon as a “revival” of Islam that is sweeping the Aboriginal population, particularly among young men. But the sociologists report that according to the 1996, 2001 and 2006 censuses, far more Aboriginal people have moved to the “no religion” category than have taken up Islam-20.57 percent as compared to a national average of 18.6 percent. The percentage of Aboriginal people claiming to be Muslim (0.22 percent) is smaller than the figure for all Muslims in Australia (1.7 percent). The Aboriginal population also shows a good deal of variation in converting to Islam; Aboriginal Muslims are predominantly urban (63.27 percent) and are actually less likely to be young males than their counterparts in other faiths, particularly the traditional Aboriginal religions. But the researchers do note that a greater percentage of Aboriginal men are involved in Islam (58 percent) than in other religions, and that the faith has also attracted prisoners. Part of the draw that Islam has on this native ethnic group in Australia may have to do with history. Some Aboriginal Muslims claim they are reviving their historical identity by converting because there was an early wave of settlement of Muslims who had intermarried with Aboriginal people in the 19th century. These Muslims were a mixture of seafaring traders, those from the Indonesian island of Celebes, and Arab (called “Afghan”) cameleers in the Australian outback. It was particularly the latter group that formed close ties with Aborigines, often intermarrying and sharing customs, including Islamic traditions in some cases. Some Aboriginal Muslims have traced back their roots to these early Australian settlers (which is the reason they call the current phenomenon a “revival”). But there is no unbroken line of Muslim identity or observance between these groups nor even much similarity between Islamic and traditional Aboriginal religions. 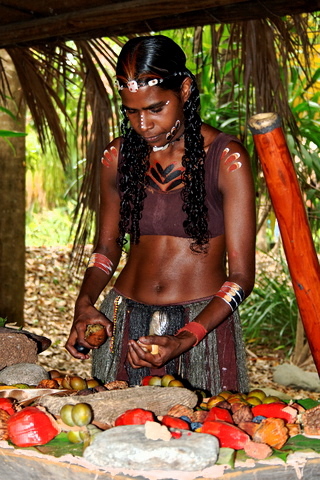 Onnudottir, Possamai and Turner argue that it is more accurate to say that some Aboriginal people have claimed an affinity with these settlers, since both groups were excluded and considered outsiders in Australia. The “black power” movement among Aboriginal Australians during the 1960s and 1970s also drew some inspiration from Islam, particularly African-American Muslims such as Malcolm X.
Onnudottir’s, Possamai’s and Turner’s paper, a version of which is featured in the International Journal for the Study of New Religions, argues that the identification of Christianity with colonial rule and white dominance over Aboriginal people may have tainted the religion and might be a reason why the percentage of Aborigines practicing a Christian religion has declined in the census. They note that Pentecostalism, the fastest-growing form of Christianity in Australia, has not found much receptivity among Aboriginal people. They conclude that the media may have billed the growth of Aboriginal Muslims as an important trend in Australian religion, but a far more significant development is the extent to which Aboriginal people have defected from any religious affiliation to embrace the dominant secularism that marks Australia today.